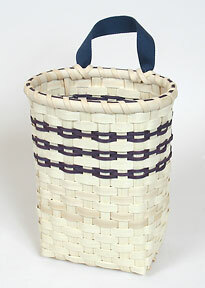 Basket size: 6 in. x 4 in. x 10 in. tall. Basket size: 6 in. x 4 in. x 4.5 in. tall. 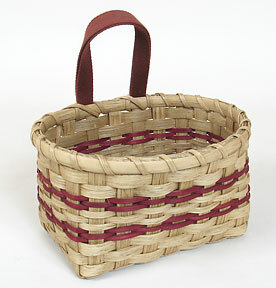 Created by Delane Kolbe of Lebanon, Tennessee, this neat little basket measures about 6 in. x 4 in. at its base. Make this easy piece 10 inches tall or make the shorter version at just 4.5 inches tall. Either way, you'll weave with natural and dyed reed, finish with a standard rim and use a short length of Shaker Tape for the handle. 'Out the Door Quick' is just that—quick and easy. It's great for hanging on a doorknob or peg in your kitchen or family room—the perfect place to keep keys or paperwork. Make up a couple of these and use them to help you stay organized, or make them as gifts! Calculate Supplies for 1 to 20 Tall Out The Door Quick baskets with the Basket Supply Calculator. The Supply List gives you the least expensive way to purchase the supplies for your quantity of baskets. View on-line or print to your printer.